When our daughter was little, we would spend Halloween trick-or-treating with the neighbors, and after, we gathered for some small bites at one of our homes. The kids would go through their loot, usually sorting and trading candy, while the adults munched on goodies like cheese and crackers, veggies and dip, shrimp cocktail, and other various appetizers. One of my good friends always served cider and donuts at our Halloween get together. Growing up, donuts and cider were a Halloween tradition in her home, so she wanted to keep that going. I was not familiar with this tradition, but I'm not one to ever turn down donuts, so I embraced this new and delicious tradition with both hands! And by that I mean a Pumpkin Spice Donut in both hands, because I'm not a huge fan of cider <wink>. I am a huge fan of cake-like donuts. Especially homemade baked donuts! The texture and flavor of baked donuts is more what I crave in a donut than the greasy fried ones. Another thing about baked donuts is they are super easy homemade! Definitely a bonus, because when I want donuts, I don't want to have to get dressed and actually drive somewhere to find them. 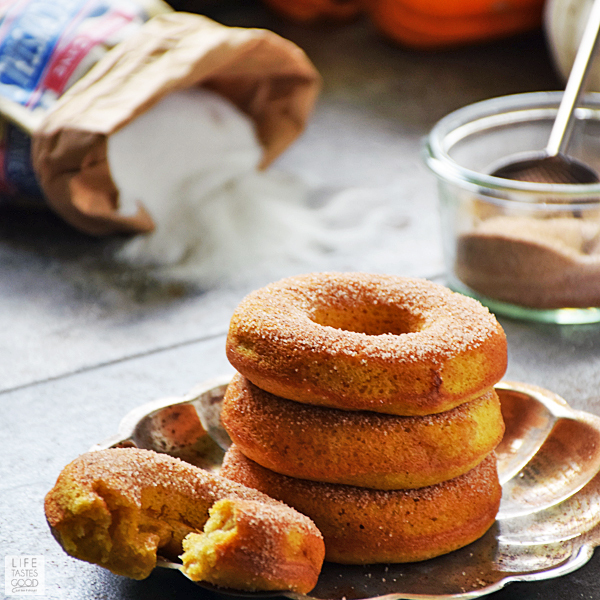 I love that I can easily whip them up in my own kitchen in almost any flavor I'm craving like these Pumpkin Spice Donuts, my Coca-Cola Cake Donuts, and the very popular Baked Eggnog Donuts. Like most everyone else, the flavor I've been craving lately is pumpkin spice! I've been seeing pumpkin spice this and pumpkin spice that around just about every corner these days. All of these pumpkin spice treats inspired me to get in the kitchen and make these Pumpkin Spice Donuts. I'm so happy with how they turned out. The flavor isn't too over the top, in your face pumpkin spice, because I don't like the pumpkin spice to overpower everything. With the subtle pumpkin flavor and a dusting of cinnamon sugar, these Pumpkin Spice Donuts give you a warm fuzzy fall feeling. I think they are perfect for a Halloween tradition of cider and donuts. Have you ever heard of that tradition? What are some of your favorite Halloween traditions? 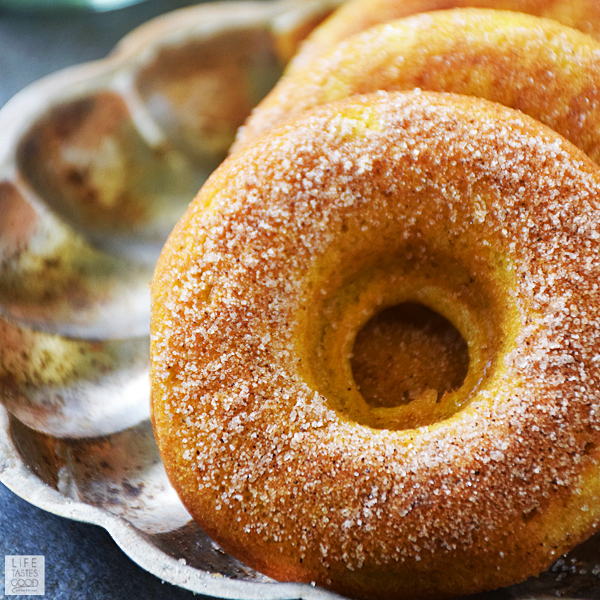 Use quality ingredients for best flavor and results when making these Pumpkin Spice Donuts. Take cold ingredients out of the fridge to come to room temperature about an hour before you want to bake the donuts. Measure flour by scooping or spooning the flour into your measure cup and then level the top for a more accurate amount. 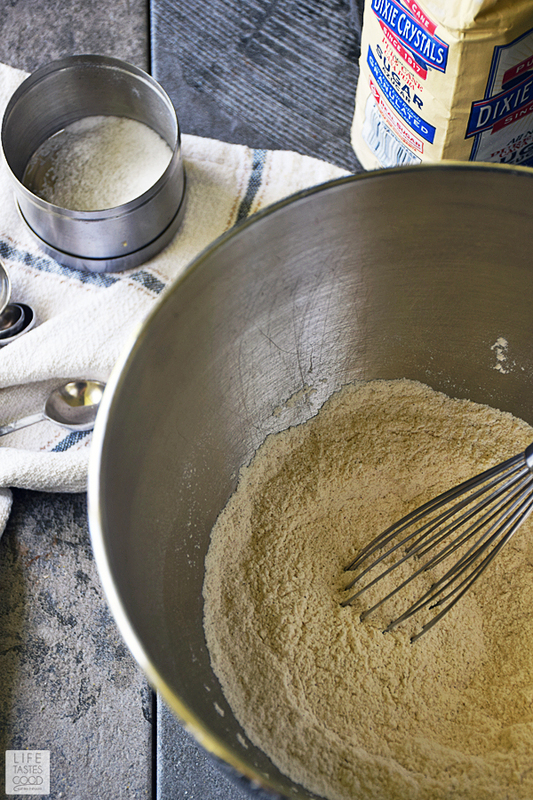 If you scoop out the flour with your measuring cup, it is likely to get packed and be too much. Mix by hand with a rubber spatula and be careful to not over mix. After pouring the wet ingredients into the dry ingredients, mix just until incorporated. It will be lumpy. Then carefully fold in the pumpkin. Once the ingredients are combined, walk away! That is the time when you set your oven temperature to 400°F and allow it to preheat. During the preheating, let the batter sit. This will give you a fuller donut. Most home cooks will already have many of the tools needed to make this recipe with the exception of the donut pan. For your convenience I've listed the tools I use when making my homemade baked Pumpkin Spice Donuts. Just click on the item name and find the product I use on Amazon. Thank you for visiting! Let's be social! In a large mixing bowl, combine 1 cup all-purpose flour, 1/2 cup sugar, 2 1/2 teaspoons baking powder, 3/4 teaspoon pumpkin pie spice, and 1/4 teaspoon kosher salt. Whisk to combine and aerate the mixture. 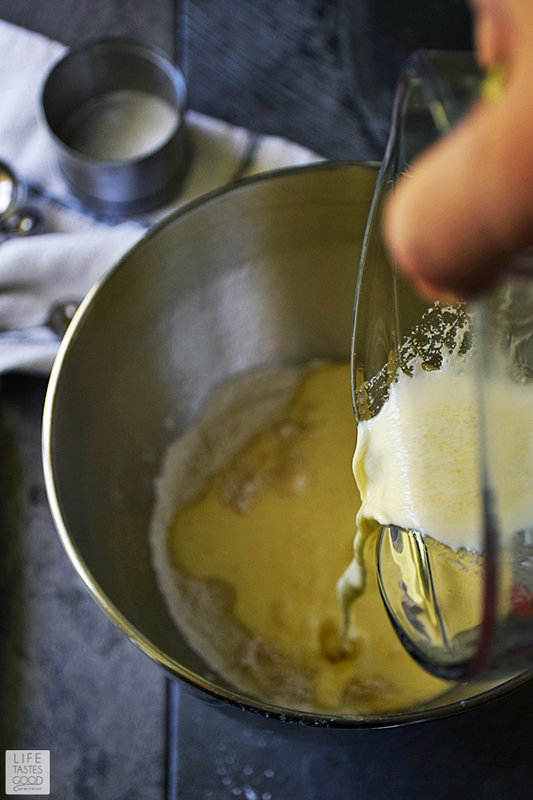 In a medium bowl or measuring cup, whisk 1 egg and add in 3/4 cup milk and 5 tablespoons melted butter. Whisk to combine. Make a well in the center of the dry ingredients and pour the wet ingredients in. Using a flexible spatula, gently fold the ingredients together. Fold until the mixture is just combined. It will be lumpy. Just make sure you get all the flour off the bottom of the bowl and combined with the wet ingredients. Stop mixing as soon as the ingredients are combined. Gently fold in 1/4 cup pumpkin puree until just combined. 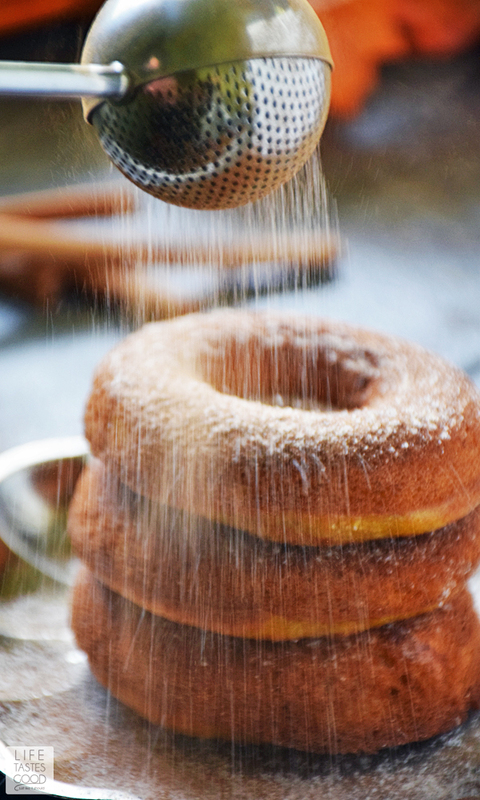 While the batter is resting, preheat the oven to 400°F and spray the donut pan with Baker's Joy baking spray. Once your donut pan is ready, keep your hands busy, so you aren't tempted to stir the batter. I usually clean up my mess or even leave the kitchen all together until the oven is ready. When the oven is ready, I grab my greased donut pan and scoop the batter into a piping bag. Do not stir the batter!! Pipe the batter into the donut rounds, filling them about 3/4 full. You can use a storage bag with a small hole cut into one corner to pipe the batter. 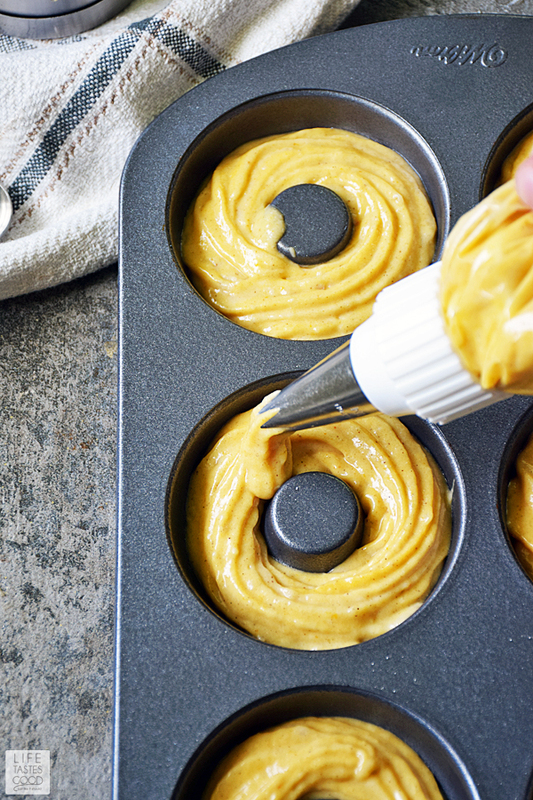 It doesn't have to look pretty, but piping makes it easier to get the batter into the donut pan. This recipe should make 8-9 donuts. Bake the donuts in the preheated oven for 12-14 minutes or until the top bounces back when pressed lightly. Oven temps vary, so the baking time will vary. Leave the oven door closed during baking. 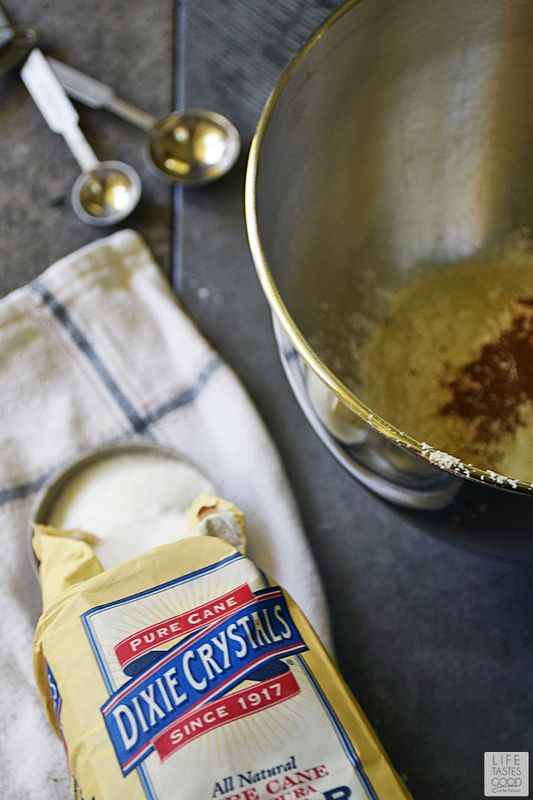 While the donuts are baking, mix 3 tablespoons sugar with 1 teaspoon ground cinnamon until combined. 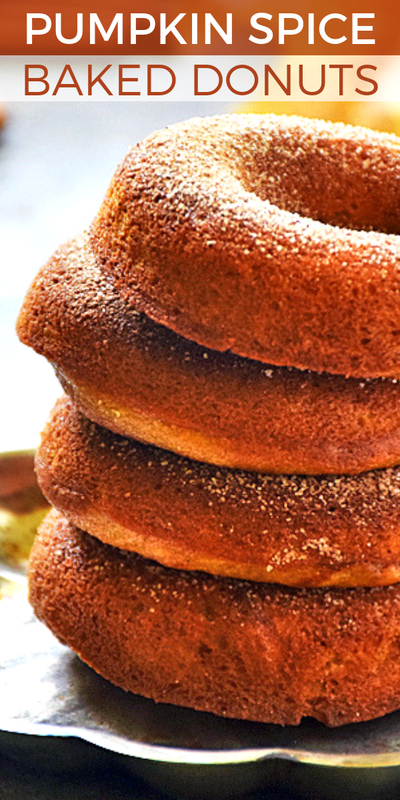 While still warm, dust the donuts with cinnamon sugar to your liking. Enjoy! 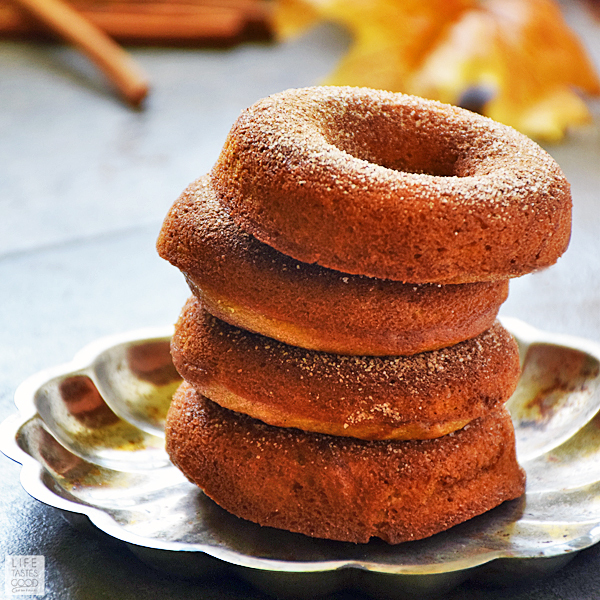 **My Pumpkin Spice Donuts recipe was originally published on Life Tastes Good on October 16, 2016. 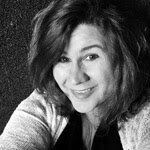 The post was updated and republished on October 11, 2018. What a scrumptious way to start the day!!! Lovely, seasonal donuts!! Do you deliver? I would like 2 dozen please! These look Amazing! Love a pumpkin doughnut! These sound amazing! Love the "sprinkle" shot!